CNN has just aired for the first time its new documentary “Targeting Terror: Inside the Intelligence War”, video link here. I think a very similar documentary has been aired before, but this one is fully updated because of the Paris attacks. The film begins by summarizing the events of Friday, November 13, 2015, suggesting that some establishments were targeted because they are popular with the affluent and young. They film briefly covered the brutality of the attacks, and the way the attacks were seemed directed at civilians as individuals. This is very difficult to process. Were this to happen to me, I don’t think I would want to survive it. I personally process this in combination with my previous experience with the US military draft during the Vietnam era. Because of some advantages, I got out of much of the exposure to “sacrifice” that others faced. The vocabulary for young men then was “casualty”, not “victim”. I do think this loops back into the way we need to look at resilience as a personal moral issue, a concept that is very double-faced in libertarian circles. But then the film shifted gears, and focused on the possibility of cyberterror. This part of the documentary briefly followed the points of Ted Koppel’s recent book “Lights Out” (Book reviews, Nov. 10, 2015). It mentioned the August 2003 blackout in the Northeast caused by cascading software problems after a fallen tree in Ohio (not by terror). The documentary seemed to suggest that Russia, China, and North Korea probably have more capability to do cyber damage than Islamic terrorists. (It did not get into the area of EMP devices, but probably not have.) But the question remains if critical infrastructure components are unnecessarily connected to the Internet. The film showed the operations of the National Counterterrorism Center in Tysons Corner, VA (an employee. Sean Green was mysteriously murdered in Prince Georges County MD in 2008 in a cold case, resembling another case of Kanika Powell, link). It then went back to the problem of how terrorists can use end-to-end encryption on devices and go dark. The previous demonstrations, inspired by Edward Snowden, were showed. Richard Ledgett at the NSA hinted that there might be limited tools to get around them. Then the documentary focused on satellite surveillance, as monitored by the National Reconnaissance Office near White Sands NM (I was in the area the weekend that I moved from NYC to Texas in January 1979). Betty Sapp, and an Air Force LT Col spoke. The documentary showed virtual reality simulations of enemy targets based on satellite surveillance, including the habitat of Osama bin Laden at Abbottabad in 2011. The documentary covered the quantity of young people becoming radicalized in Europe, and showed how the grooming is done It works for ISIS because a lot of people don’t process behavior with consequences the way we do in the West, as they are not raised in environments that value individual choices. PBS Frontline: "ISIS in Afghanistan"; "Hunting the Taliban"
PBS Frontline on Tuesday, November 17, 2015 aired two short films about Islamic extremism in the far middle East. The first was “ISIS in Afghanistan”. The official site is here. The film showed an area in eastern Afghanistan near the Pakistan border. In a remote village, a relatively young male teaches weaponry to boys, showing them how to use a pistol, along with logs of religious exhortations. Although his voice is calm, the effect is quite chilling. Fifteen miles away is a village controlled by the Taliban, which expects to be challenged by ISIS. The two brothers, 13 and 17, relate their training to become suicide bombers. A local village chief says that the villagers must defend themselves with weapons they purchase; the government doesn’t protect them. The second film was “Hunting the Taliban”, which follows Pakastani police at night in a raid on a Taliban cell in a slum in Karachi. The film also shows how officials are targeted and gunned down in heavy traffic with little notice by police. 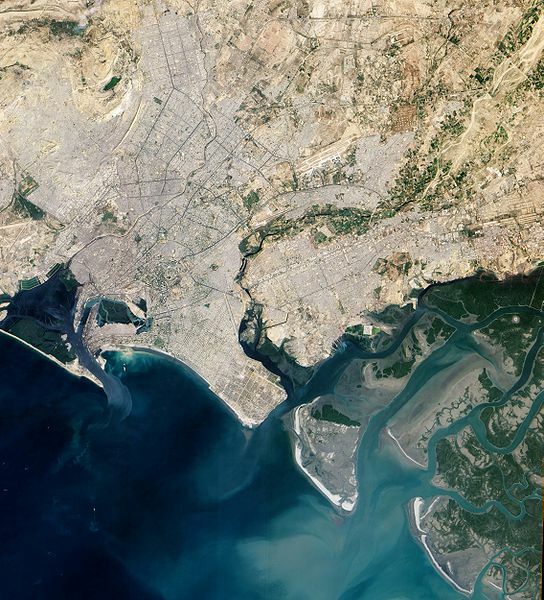 Wikipedia attribution link for NASA satellite image of Karachi, here. I am indeed reading Ted Koppel’s book “Lights Out”, and book reviews take a while. In the meantime, I thought I’d find a couple more videos on the possibility of very long-term power or Internet outages to major parts of the country. I found a 28-minute lecture “What Happens Immediately After an EMP Atack?” by Evangelist Anita Fuentes (site). This could be watched and compared to Judge Jeanine’s video reviewed here Aug. 6, 2014. Fuentes gives two big examples in history: The Carrington Solar Coronal Mass Ejection in 1857 (well before the western world was committed to electricity) and then the damage in Hawaii in 1962 from a nuclear weapons test in the Pacific 900 miles away. She conflates a manmade EMP with a solar storm. But a solar storm (which is more than just the “solar flare” of a Smallville episode), a natural and unpredictable event in space weather, is a very different beast from an EMP pulse from a man-made, enemy (whether a state or terror group’s) nuclear weapon. The higher the altitude of the blast, the wider the area affected. Localized non-nuclear flux gun devices exist (the military has them, like at Aberdeen Proving Grounds, and has used them in Iraq and Afghanistan) and could do local damage. A solar storm probably would not damage car electronics, but an EMP definitely can. She mentions the "week long" power outage in DC after the June 29, 2012 derecho (she says July 2), but more my neighborhood it was three days, and I have a generator. She doesn't mention the close call we had (missing it by a week) with a possibly Carrington-sized solar storm in late July 2012. A rogue state or terror group could carry out an attack like in the book “One Second After” (which Fuentes mentions, and reviewed in my Books blog July 20, 2012) but NORAD and coastal defenses should intercept the missiles before they detonate. Koppel fears a cyber attack the most – and I tend to disagree on what I’ve seen so far, but will take this up later when reviewing the book. Feuntas gets into religious matter (the end of times, making comparisons to the Rapture when planes fall out of the sky, as in Lahaye’s popular “Left Behind” books and movies) in the latter part of the video. Of course, I know where she is coming from. I think that the biggest benefit in discussing the threat is in making policy changes to prevent it. The power industry has made a lot of improvements in the past ten years. I am 72 years old, with no children and parents gone; and I think I’m useful in an advanced society that is based on law and order. But in an anarchist one thrown back to the 19th century by an enemy’s indignation, my own life would be shameful. Indeed, our current political situation, with partisan polarization and a tendency for most citizens to be interested only in issues that affect them short-term, makes us more vulnerable. In a world like that of NBC's "Revolution", I wouldn’t want to survive, or be saved. The terms of life would be totally different from what they are now: social combat. I have no capacity to function in such a world, or give it another generation to follow me. I do believe in karma and that an afterlife exists, and it wouldn’t be pretty if this (EMP-wipe) happened first. But I don’t experience the creator in a personalized way. There is indeed a moral paradox in “turning everything over to him” – the ultimate upward affiliation. (When you think about WWII, it seems that Alan Turing was a savior, and look at what then happened.) How could I nurture someone else’s life under such circumstances? Of course, my confessing something like this only makes us more tempting targets to those who want to replace civilization with some other “religious” order. The threat today seems even more profound than what was posed by Nazi Germany or the Soviet Union. Resilience is itself part of moral compass, something we didn’t grasp until after 9/11. But for me surviving EMP would be like surviving nuclear war itself, and I lived through the Cuban Missile Crisis as a "patient" at NIH. I’ll mention another video “How To Fix Your Vehicle After an EMP” by FrugalPrepper. He talks about a metal garbage can as a “Faraday cage”, and makes it sounds like tinkering, to replace modern electronics with older stuff, and distilling your own ethanol fuel, could get you moving again in a Mad Max world.